HomeSmartphonesAndroidHybrid apps; Reasons for their popularity and demand. Mobile apps first appeared in 2008 and since then the market for it is just going bigger and better. Mobile applications have become an essential need of businesses to capture the modern customers of today. App developers from all over the world are just striving to fulfil the customer needs of best user experience on mobile. It has become challenging and confusing to develop a perfect app and choose a right technique of app development for your business. Well, there are two approaches to develop a mobile app; native and hybrid. A native app is an app which works on a specific mobile operating system. Here developers use such tools and language which are apt for a specific platform or device. For example, an Android app is primarily written in Java and only works on the devices which have an Android operating system. An Apple iOS app is written in Xcode using Objective-C or Swift languages and works on Apple products only. A native app is recommended if you are creating a graphically intense app. Gaming and immersive 3D experiences which require fast performance are better pulled off with native development techniques. If not, then the hybrid app can et you save a great deal of time and money. No App store limitations:Today releasing a native mobile app means initially packing the code, submitting it to the app store and then waiting for it to get approved. The entire process takes 2 to 7 days. Further, the app developers also at times require to update their apps multiple times a day but with such limitations of app stores, it gets really troublesome and irritating for app developers. Thus, in such situations, hybrid apps emerge as a saviour. Standard experience: An app which looks completely different when opened by different browsers or devices, spoil the brand image and user experience. 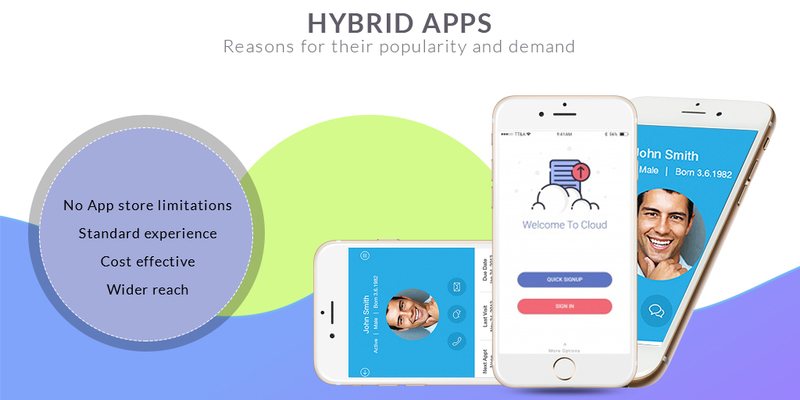 A hybrid app helps you create a standard user experience by using the functionalities and capabilities of the device on which it is accessed. Further, in case of the update also, a single update fix the app on all platforms. Thus, even if the user switches from one mobile to other, he can consistently enjoy the same experience of the app which he has been using previously. Cost effective: When compared with native app development, hybrid app development is way more cost effective. This process utilises a different set of libraries which are then linked with tools, turning out to have reduced development time for application. Further, it can be submitted to almost all platforms, making the entire process easy and less demanding. Wider reach: Just because a hybrid app can be downloaded from any store, it has a better reach to the scattered audiences of a business.